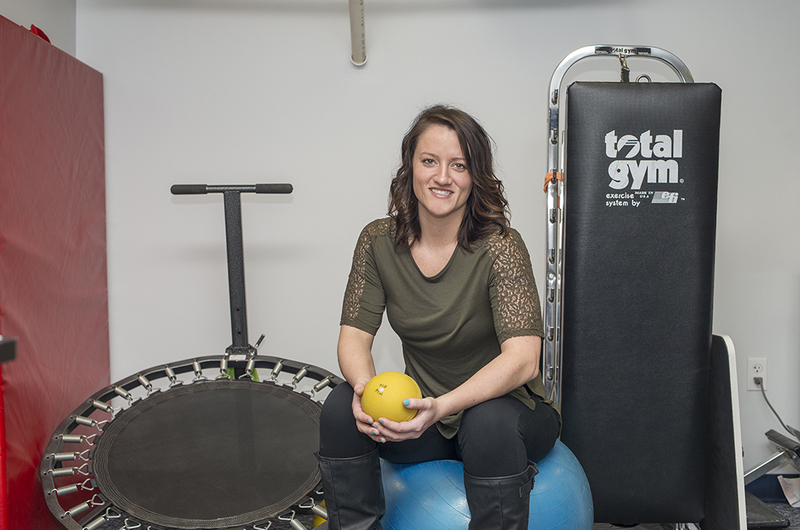 Physical Therapist Assistant student Casie Parker sums up her journey at Kellogg Community College as one of staying positive through challenging times, an appropriate summary given that her interest in PTA began with a devastating injury in high school. Parker, 25, of Vicksburg, is a 2009 graduate of Vicksburg High School, where she was on the basketball team for four years. Just before her senior season officially started, however, she tore her ACL and couldn’t play. While she was disappointed – “I was completely devastated,” she says today – her months of rehabilitation work with her athletic trainer spurred an interest in the field that culminated with her current PTA studies. Now Parker will graduate with her Associate in Applied Science degree in PTA in May. Such motivation was critical for Parker through her time at KCC, as balancing the demands of the rigorous program, work as a waitress and restaurant manager and spending time with her family became difficult at times. A self-described worrier, Parker credits her PTA instructors, in particular, with helping her to grow more confident in herself and her decision making, and says the program helped her learn to believe in herself. After graduation, Parker plans to find a job at an outpatient facility where, like her instructors at KCC, she can put her passion and training to good use helping others. Her advice for other students? Don’t be afraid to try, and don’t limit yourself. Interested in studying PTA? KCC offers an Associate in Applied Science degree in PTA! For more information about studying in the Physical Therapist Assistant Program at KCC, visit www.kellogg.edu/pta.